Sleep in a lighthouse, drift off to the sound of gently rolling waves, enjoy spectacular sunsets...The 4-star West Point Lighthouse Inn features 13 contemporary rooms and the rare opportunity to stay in a lighthouse. Each room has a breathtaking view of the Northumberland Strait from the shore of West Point, Prince Edward Island. 11 rooms also feature walkout decks, while The Keeper's Quarters and The Tower Room are located in a private guests-only section of the historic West Point Lighthouse Museum. Rentals and packages available from June to September. West Point, a small community located in western Prince Edward Island, is the destination for visitor's seeking seclusion and beauty as their holiday base. A 1,500m boardwalk traverses the dunes, and interpretive trails meander though West Point's varied eco-system of beach, dunes, and wooded areas. The background - a breathtaking view of the Northumberland Strait. Here, you'll find a lifeguard supervised shore, Cedar Dunes Provincial Park, the West Point Craft Shop, and our marina where pleasure craft and fishing boats set out to sea and dock upon return. Information about many of the amenities and attractions in the area can be found in the menu at the top of the page. The West Point Lighthouse stands among the Island's most recognizable places. At 69 feet tall, it's PEI's tallest and one of the most unique lighthouses due to it's black and white stripes of paint. Built in 1875, put into operation in 1876, and manned until 1963 when the keeper, who lived in the attached dwelling, retired, today the lantern operates electrically. In 1987, the inn was established by the West Point Development Corporation, a group of enterprising volunteers based in western Prince Edward Island. 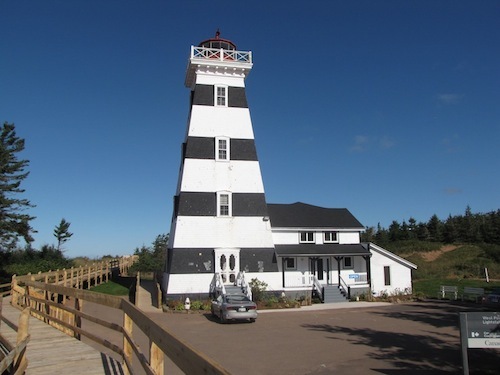 Explore PEI's coastal history in an active Lighthouse. The West Point Lighthouse is home to one of the Island's most complete collections of Lighthouse information and memorabilia. 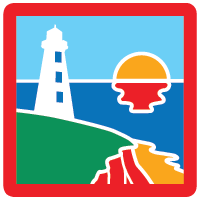 Artifacts, displays and exhibits tell the story of the community, the Lightkeepers, the technology and the history of PEI's maritime beacons in a building where this history was made. The museum is open 9:00 am until 8:30 pm daily from June - September.